Open water, an electric paddlewheeler and Austin’s famous 1.5 million Mexican free-tailed bat population await on a scenic Capital Cruises tour of Lady Bird Lake. Add fresh air and exercise to the mix with guided personalized or group running tours by Austin City Running Tours. Bring groups together for an “Amazing Race”-style journey with an Amazing Scavenger Hunt Adventure. Participants use smart phones to solve clues and scour the city on this three-hour tour. Iconic Austin is the focus on Rocket Electrics Tours’ Live Music Capitol of the World® and Lady Bird Lake bike tours. Guests enjoy “no-sweat” fun on quiet electric motorized bikes. Attendees can dive into the burgeoning food truck scene with a “Best of Austin Food Truck” tour by Austin Eats Food Tours. The operator also offers walking, bus and bike food tours showcasing quintessential Austin via big-name BBQ stops and sampling desserts from a bakery that recently won “Cupcake Wars.” Take to the Texas Hill Country for custom, behind-the-scenes winery tours with Texas Wine Tours. Looking for more ideas? 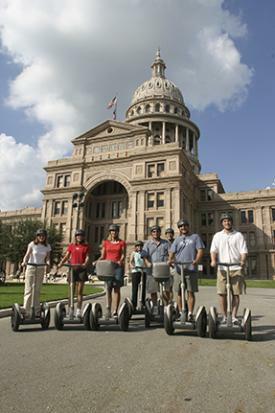 Browse more Austin tours and find the best option for your group. Locally owned Austin Detours offers themed tours featuring art, music, food, sports, culture, history and more. Austin Duck Adventures splashes into Lake Austin in an unsinkable amphibious vehicle and delivers 75 minutes of sightseeing that covers Sixth Street, the State Capitol, Bob Bullock State History Museum and more. Consider the “Austin & Hill Country in 90 Minutes” tour by AO Tours. The tour takes you through Downtown Austin, South Shore, UT campus, East & West Austin, a peek at the Hill Country & lakes, in a 30-mile relaxing drive in a customized Mercedes van. Guests take in legendary music photography and the home of the “Austin City Limits” television show on Austin City Limits Studio Tours. The freedom to hop on and hop off as desired lies in a Double Decker Austin sightseeing tour. Austin’s entertainment districts float by in a moving history lesson from a double decker bus. Contact the Austin Visitor Center (602 E. Fourth St., 866-GO-AUSTIN) for tour times and costs.